Over the past four decades (and counting), Star Wars has spawned close to a dozen movies, hundreds of tie-in novels, countless video games, stacks of comic books, action figures, radio dramas, tabletop RPGs, collectible card games, and pretty much every other type of media you can imagine — save one. While Star Wars has a number of cartoons to its name, live-action television remains that galaxy far, far away's one unconquered frontier. Oh, there have been one-offs, like the spectacular disaster known as the Star Wars Holiday Special or the made-for-TV Ewok movies. As far as an ongoing series is concerned, though? Nothing. Remember, we live in a world where even Knight Rider's gotten four different shows. You'd think that the TV industry would show something as big as Star Wars at least a little bit of love. In 2019, it's finally going to. It's been a long time coming, but we've finally got a little bit of information about the very first live-action Star Wars series, The Mandalorian, and we can't wait to share it with you. 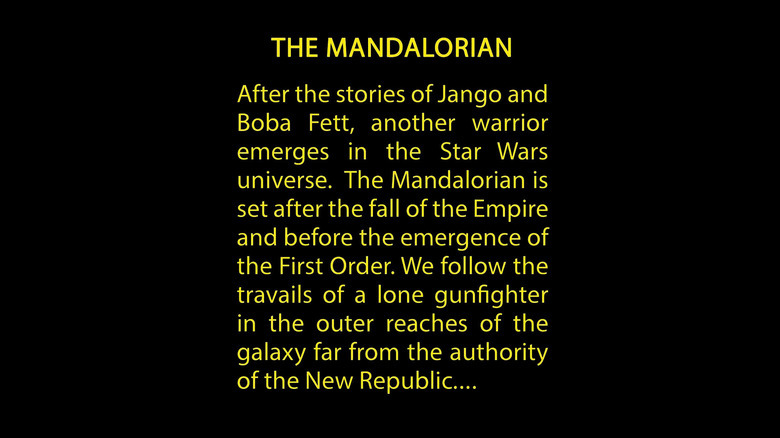 In October 2018, Mandalorian creator Jon Favreau (more on him in a bit) posted a picture on Instagram that evoked the classic Star Wars opening crawl and laid out exactly what The Mandalorian will be about. The series will focus on "the travails of a lone gunfighter in the outer reaches of the galaxy far from the authority of the New Republic," and will explore the rocky transition from the Galactic Empire to a brand new government. If that makes The Mandalorian sound like a western, that's not an accident. At Star Wars Celebration 2019, Favreau and fellow producer Dave Filoni confirmed that The Mandalorian, like the original Star Wars, is heavily inspired by both spaghetti westerns and Akira Kurosawa's samurai films. Like the heroes in those stories, the Mandalorian is a lone fighter "of questionable moral character" who flies a ship called the Razor Crest and does whatever it takes to survive. Plot specifics are still slim, but we know that actor Pedro Pascal is modeling the Mandalorian on Clint Eastwood, and that the gunslinger will run across a character named Greef, the head of a loose coalition of bounty hunters who has a special mission for the titular character. According to clips shown to the Star Wars Celebration audience, he'll also cross paths with an old Imperial loyalist who wants to see the Empire take back control of the galaxy — and it sounds like the Mandalorian isn't totally against the idea. But what is a Mandalorian, exactly? In Star Wars lore, Mandalorians are fierce warriors with a long, proud, and surprisingly complex history. You may not have seen them before, but you're probably familiar with their most iconic creation: Boba Fett wears Mandalorian armor, as did his father, the bounty-hunter-turned-clone-daddy known as Jango. Mandalore hasn't played much of a role in the movies, but it's a big, big part of the Star Wars cartoon shows. In The Clone Wars, Mandalore has been ravaged after centuries at war, including an old and ancient conflict with the Jedi. When a Duchess tries to establish a pacifist government, a group of exiled warriors strike back, leading to a full-on civil war. Later, Darth Maul (who's not quite as dead as you think) conquers Mandalore, and uses the planet as a headquarters for his criminal syndicate, the Shadow Collective. So, yeah, Maul's brief Solo cameo isn't quite as random as it seems. Here's a little secret: he might dress like one, but Boba Fett isn't actually a Mandalorian, at least not in the new, Disney-ified canon. 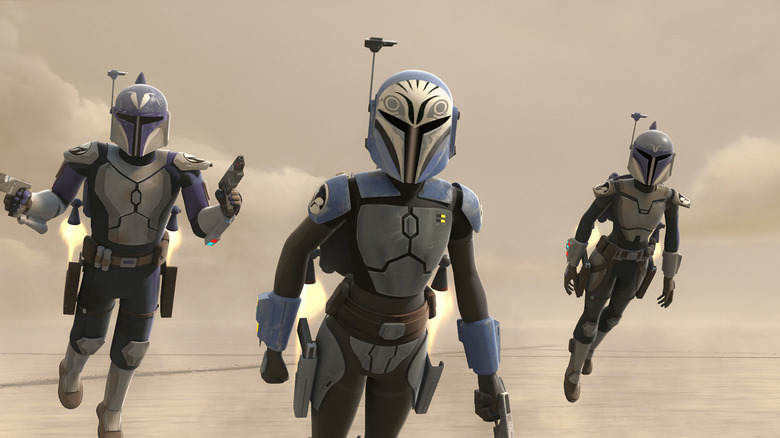 In The Clone Wars episode "The Mandalore Plot," the Mandalorian Prime Minister tells Obi-Wan Kenobi that Boba's dad, Jango, is just a regular ol' bounty hunter who wears someone else's armor. But, thanks to Boba, we knew what a Mandalorian looked like decades before we knew anything about them as a people, and The Mandalorian wouldn't be the same without him. 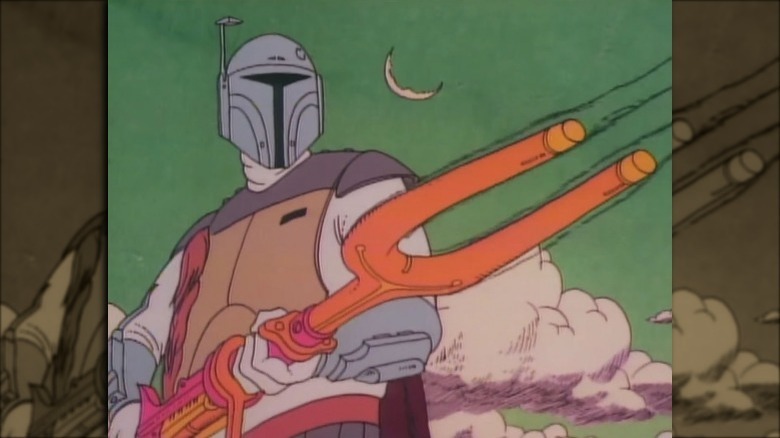 Boba Fett debuted during the Star Wars Holiday Special, and while the rest of the program isn't worth your time, Nelvana Studios' animated short "The Faithful Wookiee" absolutely is. Not only does the sequence make Fett cooler than the movies ever did — no falling into man-eating pits here — but the design ended up influencing both how the Mandalorians looked on The Clone Wars and The Mandalorian's costume, too. That big ol' holster, the narrow visor, the natural color scheme, and the visible battle damage? Those are all Nelvana. The Holiday Special short also gives an idea as to what The Mandalorian might look like. In fact, Nelvana's animators looked to westerns when storyboarding the short. "The Faithful Wookiee's" surreal landscapes and the dinosaur that Boba rustles and rides might be a little too fanciful for live-action TV, but if you want to see Star Wars reimagined as a spaghetti western, you don't have to wait for The Mandalorian's premiere. There's already an example out in the wild. As revealed at the Solo premiere, The Mandalorian will take place a few years after The Return of the Jedi, and a couple of decades before The Force Awakens. At this point, the Rebel Alliance has transformed into the New Republic, while the former Imperials who'd eventually form the First Order are still licking their wounds in the galaxy's Unknown Regions. Leia Organa is busy serving in the Galactic Senate. Her husband, Han Solo, splits his time between taking care of their kid Ben, i.e. the future Kylo Ren, racing spaceships, running his own shipping company, and teaming up with his buddy Lando for the occasional New Republic mission. Don't expect to see them (or any of the other main Star Wars characters) in The Mandalorian, however. The new Disney television show takes place far from the New Republic's capital, and should feature mostly new characters. 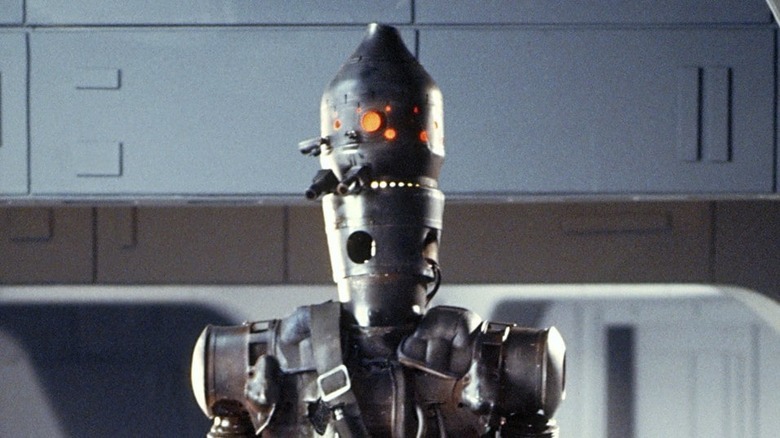 Still, The Mandalorian is set to feature at least one classic Star Wars foe: IG-88, a bounty-hunting droid who appeared in The Empire Strikes Back, will be played in The Mandalorian by Taita Waikiki, who stole the show as Korg in Thor: Ragnarok. The Mandalorian will also be full of familiar sights and sounds, including Jawa sandcrawlers, lizard-like Dewbacks, Return of the Jedi-style speeder bikes, and one droid that classic Star Wars fans will recognize immediately. The Mandalorian's main cast might be brand new, but don't worry. You're still going to feel right at home. You might've noticed that Jon Favreau's name comes up quite a bit when talking about The Mandalorian. There's a very good reason for that: the accomplished director is running the whole shebang. As Disney's initial press release states, Favreau is executive producing and writing The Mandalorian, and while he's not on the series' list of directors, we're confident that The Mandalorian is in pretty good hands. See, in addition to flicks like Elf, Zathura, and Chef, Favreau directed a little something called Iron Man. You know, the movie that single-handedly launched the Marvel Cinematic Universe, revitalized Robert Downey Jr.'s career, and made Tony Stark a household name? Yeah, that Iron Man. Favreau also served as a producer on The Avengers and helmed Disney's live-action Jungle Book and Lion King adaptations. In other words, he's got a flair for making special effects-driven dramas that are also full of humor and heart, and he's an old pro when it comes to launching franchises. Sound like a good fit for Star Wars? Yeah, we thought so too. 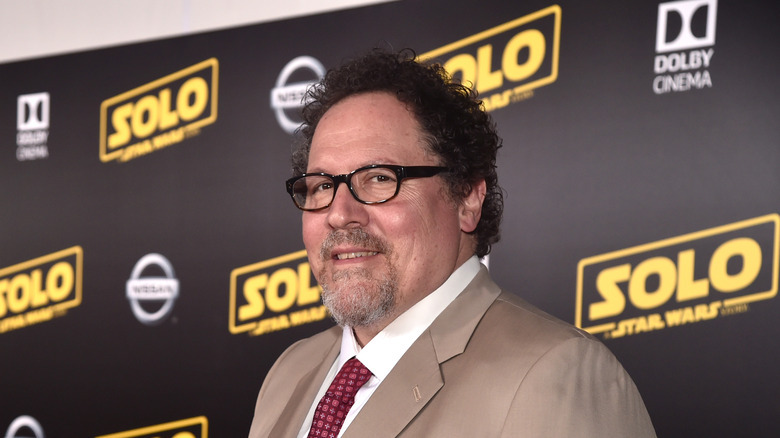 Not only that, but Favreau has already proven his Star Wars bona fides: as an actor, he's participated in not one but two separate Star Wars projects. 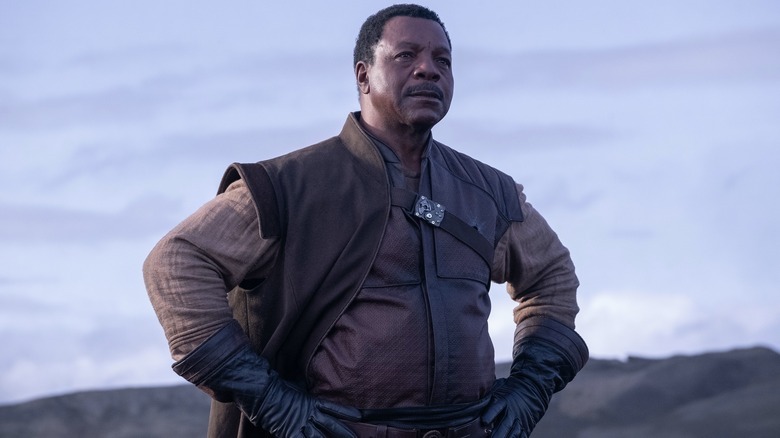 If you saw Solo, you might recognize Favreau as the voice of Rio Durant, Tobias Beckett's multi-armed pilot. The Mandalorian won't be Favreau's first dalliance with the show's titular warrior race, either. On The Clone Wars, Favreau played Pre Vizsla, the exile who started the Mandalorian Civil War, helped the Shadow Collective conquer the planet, and ultimately met his demise at the wrong end of Darth Maul's lightsaber. If you're still worried that Favreau isn't up to the task of bringing Star Wars to the small screen, don't be. He's got some help. Longtime Lucasfilm president Kathleen Kennedy is listed as one of the show's producers, and all of the material will still go through Lucasfilm's story group, the organization in charge of keeping Star Wars canon consistent. Favreau's also getting a big, big hand from the animated side of things. Dave Filoni may not be a household name, but if you're a modern day Star Wars fan, you know his work very, very well. 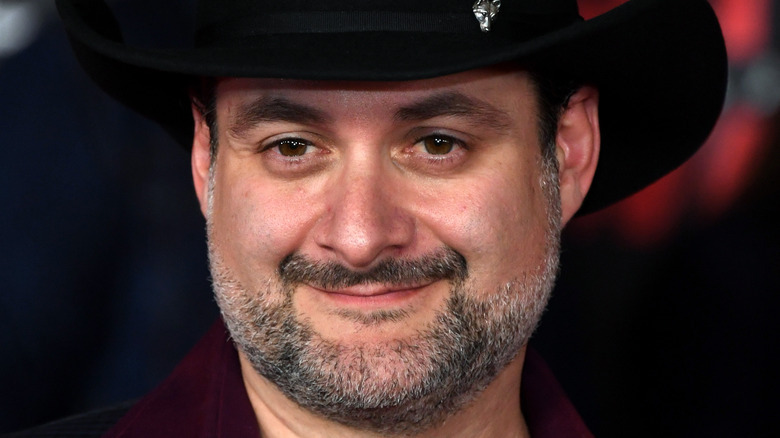 Filoni directed The Clone Wars feature film (which, let's face it, isn't really something to brag about), and he worked side-by-side with George Lucas to bring the subsequent, superior animated series to the air. Filoni also co-created both Rebels and the newest Star Wars cartoon, Resistance. In other words, he's the guy behind a lot of the best of parts modern Star Wars canon. According to The Art of Star Wars: The Clone Wars, Filoni is the brains behind Anakin Skywalker's beloved apprentice, Ahsoka Tano. On Rebels, Filoni and his staff raised questions about the Jedi's relationship with the Force years before Rian Johnson and The Last Jedi did the same. Heck, he even voiced Chopper, Rebels' scene-stealing droid. Naturally, Filoni will be bringing his informed, insightful, and nuanced take on Star Wars to The Mandalorian, too. He's one of the show's executive producers, and he'll make his live-action directing debut by helming The Mandalorian's very first episode. The Mandalorian won't be short on star power, at least not behind the camera. Reports say the show has a 10-episode first series, and Disney shared a list of some of the people who'll be directing a few of the episodes. Buckle up. It's a doozy. Dave Filoni's there, obviously, but by far the biggest name on the docket is New Zealand native Taiki Waititi. You know why that's exciting? Here are a few reasons: Eagle vs Shark. Flight of the Conchords. What We Do in the Shadows. Hunt for the Wilderpeople. Thor: Ragnarok. So, yeah, he's pretty good. On the other hand, Bryce Dallas Howard might be best known for her performances in projects like Jurassic World and Black Mirror, but she's wanted to get into directing for a while. In fact, Howard already has a number of short films under her belt, and besides, Star Wars runs in the family. Her Oscar-winning father, Ron, just directed Solo: A Star Wars Story. Further down the list you'll find Rick Famuyiwa, director of the criminally underrated Dope, and Deborah Chow, a television veteran who's worked on shows like Jessica Jones, Mr. Robot, Better Call Saul, and The Man in the High Castle — y'know, just some of the best dramas currently on television. Honestly, it's hard to imagine a better lineup, but then again, it's not every day that you get to contribute to a cultural institution. 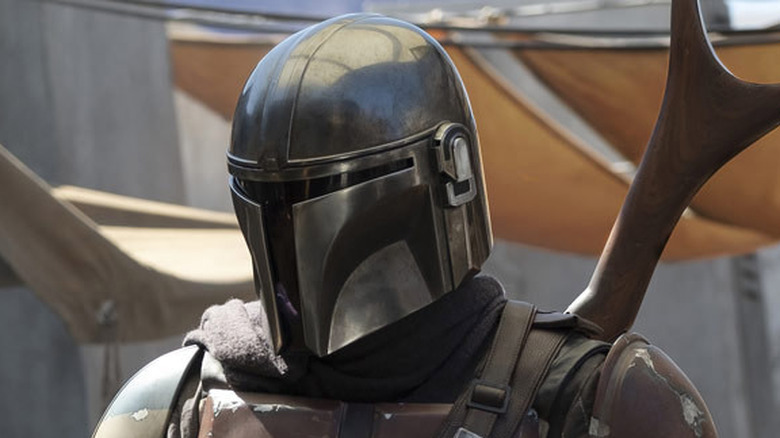 We wouldn't be surprised if The Mandalorian has talent lined up around the block, just waiting for a shot at a galaxy far, far away. 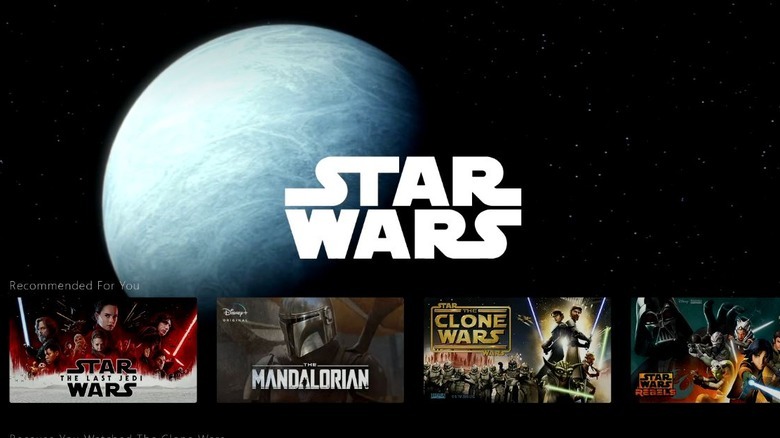 While The Mandalorian would be a hit on almost any channel — c'mon, it's Star Wars — you're not going to be able to watch it via regular cable. The show will air exclusively on Disney+, Disney's streaming service that's going to be the new home for, well, almost everything. The series launches on November 12, 2019, and The Mandalorian pilot will be available on day one. A subscription will cost $6.99 a month (or $70 if you subscribe for a full year), although that price will probably go up over time. If you're a Star Wars fan, you're probably going to want to subscribe. In addition to The Mandalorian, Disney+ will host all of the Star Wars movies, a second live-action Star Wars show (see below), a new season of animated series The Clone Wars, and behind-the-scenes documentaries — and, reportedly, that's just the beginning. Disney+ will also be crammed full of Marvel content, including all of the MCU movies, a Scarlet Witch-Vision team-up called WandaVision, a Loki solo series, a Falcon and Winter Soldier show, and the animated What If? adaptation. Every single one of Disney's animated films, even those initially relegated to the "vault," will be on Disney+, as will original Disney programming like High School Musical: The Series, a rumored Muppets revival, and more. Throw in all 30 seasons of The Simpsons and a National Geographic documentary series starring Jeff Goldblum, and Disney+, and you're getting a lot of content for your money. Watch out, Netflix. The Mandalorian is coming. Now, The Mandalorian isn't the first time that Lucasfilm has tried to bring live-action Star Wars to the small screen. The company has been working on this for a while. In 2005, George Lucas announced that a live-action Star Wars show was in development. The series, which was eventually known as Star Wars Underworld, was set between the prequel and original trilogies, and took place on the Imperial capital Coruscant, with a primary focus on the planet's seedy criminal underbelly. Allegedly, about 50 scripts were written before Underworld was put on hiatus. The reason? It's all about the cash, baby. "The scripts were written as if money was no object," Battlestar Galactica mastermind Ronald D. Moore, who worked in Underworld's writers' room, told EW. According to Lucas, every episode would've been equivalent to a $20 million film, although he claimed he could produce it for a fraction of that by using his own facilities and digital technology. He wasn't willing to compromise his vision, either. If that meant postponing production until Underworld's special effects could be accomplished on a TV budget, well, then he'd just wait. That was 2011. 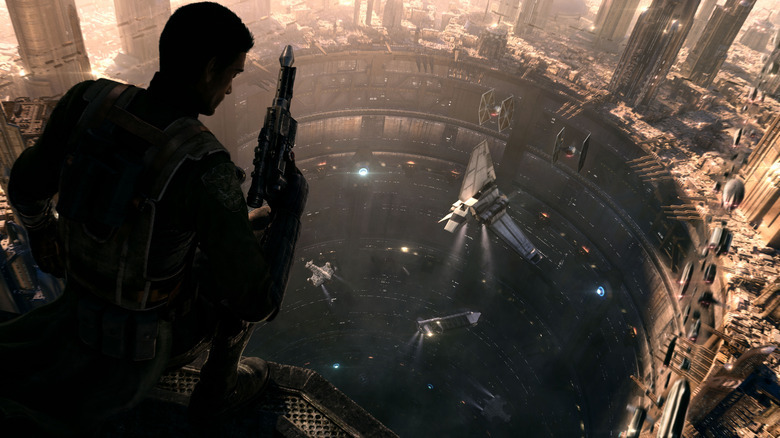 In 2012, Disney bought Star Wars for $4 billion, and Underworld suddenly went into limbo. In 2013, ABC's Paul Lee said that Disney, ABC's parent company, was reevaluating Underworld, and when Jon Favreau's series was announced, many fans wondered if some of Underworld (and 1313, Underworld's cancelled video game tie-in) would make its way into the new project. Given what we know now, probably not, although The Mandalorian inherited at least one thing from its predecessor: the price tag. Reportedly, every episode of the show will cost $10 million to make. Yikes. The Mandalorian might be new, but the actor playing him isn't. Pedro Pascal, who you probably know best as the dude who had his head crushed by the Mountain on Game of Thrones, will be the man behind the Mandalorian's signature armor. He's not coming alone, either. For The Mandalorian, Disney and Lucasfilm have assembled a top-tier cast that's full of genre-fiction favorites. Former MMA star and American Gladiator and current action hero Gina Carano will play Cara Dune (or however it'll end up being spelled), a former Rebel shock trooper who's having trouble reintegrating with society now that the war is over. Carl Weathers, Rocky's Apollo Creed, will portray Greef Marga. Critically acclaimed director Werner Herzog steps in as The Mandalorian's pro-Empire crime lord, while Star Wars Celebration footage revealed that Breaking Bad and Better Call Saul villain Giancarlo Esposito will play a caped TIE Fighter pilot. But wait, there's more! The Mandalorian has tapped Academy Award nominee Nick Nolte for a currently unspecified role, and has fleshed out its cast with comedian Bill Burr, The Mentalist and Supernatural's Emily Swallow and American Gods' Omid Abtahi. That's a lot of star power, and chances are that it didn't come cheap. With The Mandalorian, Disney isn't messing around. With Disney reconsidering its approach to Star Wars spinoff films, the Skywalker saga coming to a close with 2019's Episode IX, and Rian Johnson and the Game of Thrones team's dual film series still years away, television looks like it'll be the go-to source for new Star Wars adventures in the near future. Thankfully, The Mandalorian won't be shouldering that burden all on its own. Not only is the Disney Channel cartoon Star Wars Resistance off to a strong start, but there's a second Star Wars series coming to the Disney+ streaming service, too. Unlike The Mandalorian, however, the other live-action Star Wars show will feature at least one familiar face. 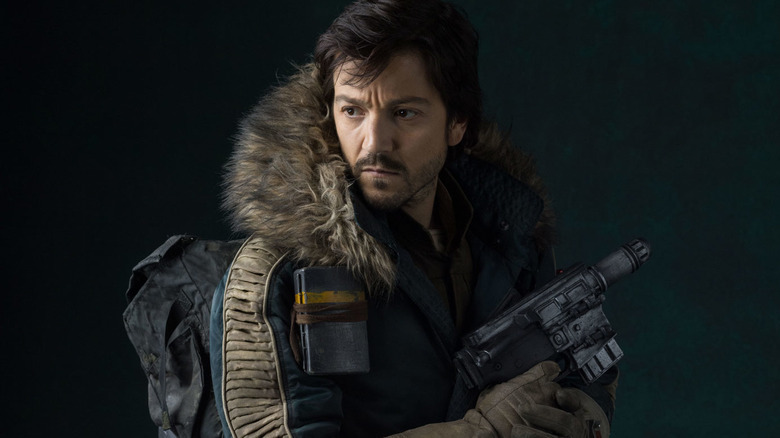 Diego Luna, who played Rebel spy Cassian Andor in Rogue One: A Star Wars Story, will reprise his role in an untitled series set to debut at an unspecified date. The show will be set sometime before the events of Rogue One, and will reportedly focus on "the formative years of the Rebellion." That means that The Mandalorian and the Cassian Andor series won't directly overlap — they're set in two very different time periods — but it'd wouldn't be surprising to see one reference the other. Under Disney's stewardship, everything is connected. If a theme park, a novel, and possibly a movie can share a setting, it's pretty easy to imagine The Mandalorian picking up a character, vehicle, or planet from Andor's adventures. We'll just have to wait and see. At Star Wars Celebration 2019, Jon Favreau repeatedly emphasized that The Mandalorian will be one giant love letter to the original Star Wars trilogy, and that tribute extends behind the scenes as well. Favreau wants to make sure The Mandalorian feels like our first visit to that galaxy far, far away, and that means embracing some old-school film production techniques. Naturally, green screens and CGI are necessary to deliver The Mandalorian on a TV budget, but Favreau says that the crew is also using puppets, animatronics, and special effects makeup wherever possible. For example, while the dogfights in the modern Star Wars films are mostly computer generated, Favreau really wanted to make a model of the Razor Crest to use during production. 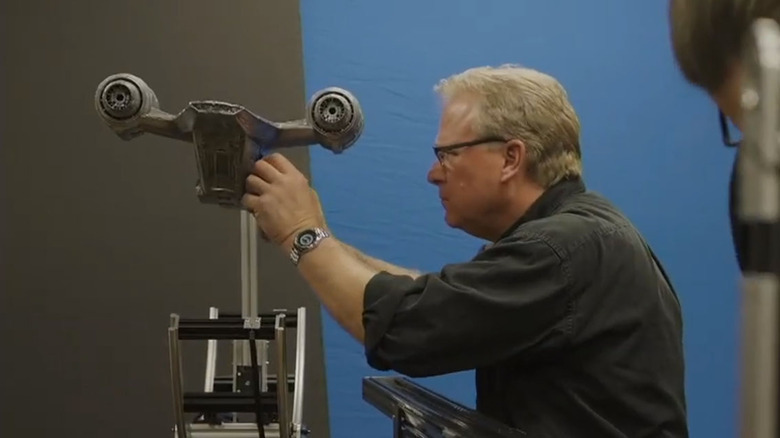 Well, Industrial Light & Magic's art staff were so excited about the idea that they didn't just make a model. Unprompted, they went home and built a camera rig in their garages, recreating the hardware that was used to make Star Wars back in 1977. The end result looks just like classic Star Wars films. It's very cool. ILM's staff aren't the only Star Wars fans who got in on The Mandalorian action, either. One day, The Mandalorian's crew realized that they were short on stormtrooper extras and costumes. To fill in the scene, the show's producers reached out to the 501st Legion, a group of Star Wars aficionados who make their own, highly detailed stormtrooper outfits. Lucasfilm has teamed with the 501st before for promotional events, but The Mandalorian marks the first time that the 501st has appeared onscreen in an official Star Wars production.